“What is the name of that tree?” people often ask when travelling through the province of Manabi, Ecuador. “The one that sinks its toes into the earth, pokes out its belly, stretches its arms into the sky and looks almost human?” I smirk. 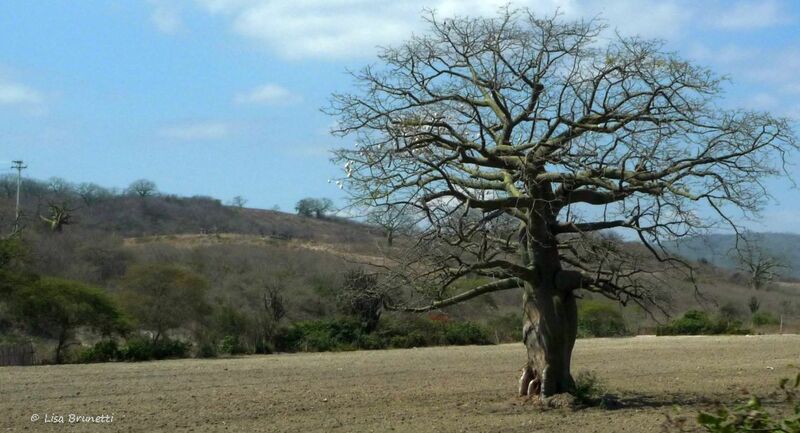 A close cousin to tropical America’s Ceiba trees, the Ceibos look as if they could pull up roots and waltz across the landscape beneath the spell of a full moon! Anyone who has ever gaped up at cumulus clouds and seen faces or animals will easily see the humanesque traits of the ceibos. Many cultures consider this family of trees sacred, and the Mayans believed the roots reached the underworld while the branches extended into the heavens. Also called the Kapok Tree or Silk Cotton Tree, it was once valued for the cottony tufts attached to the seeds. Extremely light and basically waterproof, the kapok was used as stuffing for life preservers, pillows and mattresses. Fascinating. I love trees with bare branches. I drew one once. I’ve drawn them a lot, I suppose. Not as magnificent as yours, but there’s one in particular I’m thinking of. Will try to find the post it’s in. Thanks for sharing the backgound on this magnificdent piece of mythology. The tree I’m thinking of is the last image in the following post. It’s very small–4 by 6 inches in color pencil. amazing work! thank you so much for sharing!